Over the years, the Restaurant and Bar at The Riverfront have been a favourite location for locals and passing trades. Here at The Riverfront, we put particular emphasis on high-quality cuisine. Our chefs source as many local ingredients as possible. All this is served to you in a relaxed no-fuss atmosphere. Lunch and Dinner are served from our seasonal changing a la carte menu. Our kitchen team will also provide you daily with market fresh specials from our blackboard. We are proud of our reputation for the traditional Sunday lunch served to your table. We can also provide Pre-Theatre menu for groups when pre-booked. Irish Bacon, Thomas Doherty’s Award-Winning Sausages and Black & White Pudding, Fried Egg, Potato Hash Brown, Mushrooms, Thyme Scented Grilled Tomato & Baked Beans. Irish Bacon, Thomas Doherty’s Award-Winning Sausage, Fried Egg, Thyme Scented Grilled Tomato & Baked Beans. Creamy Scrambled Eggs with a Thyme Scented Grilled Tomato & Toasted Sourdough Bread. American Style Pancakes with Fresh Strawberries and Maple Syrup. Toasted Sourdough Bread with Fruit Preserves, Irish Creamy Butter & Freshly Brewed Tea or Coffee. Choose from our Selection of Freshly Baked Pastries, Croissants & Muffins. Please note that the following is a sample menu only. The Riverfront lunch menu changes daily. Crispy Chicken Gougons, Fresh Tomato, Rockett Leaves and Piri Piri Sauce. Served with a Selection of Freshly Baked Breads. Baby Gem Lettuce, Homemade Caesar Dressing, Crispy Streaky Bacon and Grilled Garlic Bread. Homemade Chicken Liver Pate with Spiced Apple Chutney and Mini Toast’s. Accompanied with Musclum Salad and Horseradish Sauce. Marinated Crispy Chicken Wings coated in a Homemade Oriental Sauce. Portobello Mushroom Bruschetta with Rosemary Aioli. Thai flavoured Crab Meat with Homemade Chilli Jam and Rocket Salad. Thomas Doherty’s Black Pudding Salad served with Caramelised Apple Sourdough Croutons and Aged Balsamic Dressing. Breaded Irish Brie Wedge, Mixed Salad and Caraway Scented Red Onion Compote. 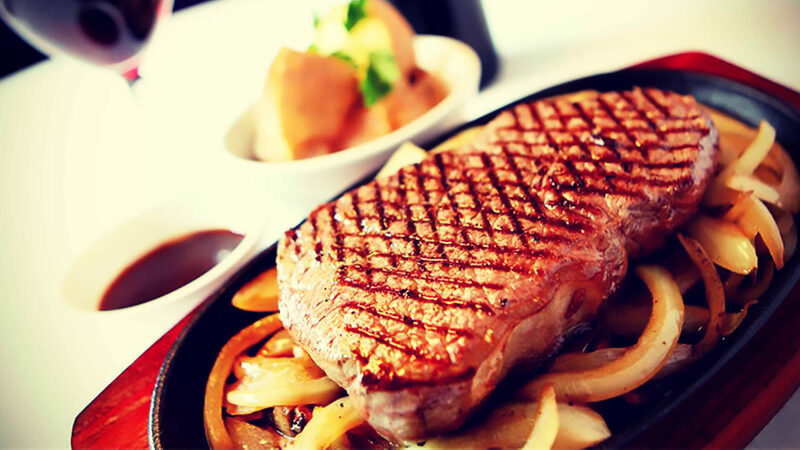 All our Steaks are 100% Aberdeen Angus Beef. All Steaks are served with a Thyme Scented Fondant Potato, Mushroom & Perl Onion Ragout, Peppercorn Sauce or Garlic Butter. Please allow sufficient time for well-done Steaks. 2 x 4oz, Steak Mince Burger served on a Freshly Baked Bap with Crispy Streaky Bacon, Cheese, French Fried Onions, Tomato. Chicken Fillet Marinated in Cajun Spices with Rocket Leaves, Jalapeno Peppers, Cheese and Secret Sauce all on a Freshly Baked Bap. Mildly Spiced Chicken Curry served with Steamed Basmati Rice, Poppadum, Yogurt Drizzle and Mango Chutney. Marinated Chicken Strips in our Spicy Stir Fry Sauce with Bamboo Shoots, Water Chestnuts and Bell Peppers served with Steamed Basmati Rice. Crumbed Irish Chicken Fillets, Jack ‘D’s Dipping Sauce and Mixed Salad. Grilled free-range Chicken Supreme, Buttered Greens and Tarragon Cream. Boneless Honey Roast Half Duck, Wilted Bok Choy & Fondant Potato with a Spiced Port & Orange Sauce. With Champ Mash, Red Cabbage and a Grain Mustard Sauce. Braised Cavan Lamb Shank with Root Vegetables and a Herb Jus. Fresh Linguini Pasta with Salmon, Hake and Prawns in a Herb Cream Sauce. Salmon Fillet served with Crushed Petit Pois, Crispy Bacon Lardons and a Lemon Butter Sauce. With Saffron, Parmesan Shavings and Rocket Leaves. Omelette with Potatoes and Vegetables. Served from 12.30 p.m. – 3.30 p.m.